Trump: French Rioters Are Still Chanting My Name - Joe.My.God. 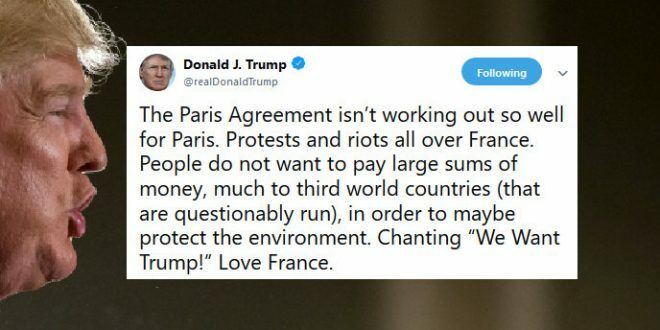 President Donald Trump sought to tie violent protests across France triggered by public anger over higher fuel taxes with the Paris climate accord, a treaty he has denounced. He also again claimed that protesters were “chanting ‘We Want Trump!’” He made the same claim on Tuesday, originally tweeted by Turning Point USA’s Charlie Kirk. Kirk’s information about crowd chants seems to come from an article Rush Limbaugh wrote on iHeart Radio on Monday, which claims that friends told him that protesters are asking for Trump. The riots in Paris — which started over fuel tax and have devolved into protests against the living standards and President Emmanuel Macron himself — have been the worst the city has seen in decades. Trump also retweeted a claim on Monday that protestors were chanting, “We want Trump,” though CNN reported that on-the-ground personnel “have seen no evidence” to support that. Although he was the first to be retweeted by the US president on this information, Kirk was not the only one to relay the idea of Trump-infatuated French protesters. On December 3, several English-language online media reported that French protesters were chanting for Trump, as well as American radio host Rush Limbaugh. The articles all backed their claims with a video posted to Twitter on December 2 by user @jackwhite, which was retweeted more than 17,000 times. In the video, a man wearing a Trump mask stands atop a bus while a crowd of hundreds of protesters chant, “We want Trump” repeatedly. However, the video was not shot during the “yellow vests” protests, nor even in France. The same scene was shared in its proper context in June 2018 by another Twitter user. The video was shot during a protest for the release of Tommy Robinson, former leader of the English Defence League, a British far-right organization. – People arent protesting against Paris agreement or environment protection at all. They are protesting against fiscal inequality and high level of taxes on the poorest people. – You don’t love France. You love yourself.